The trigger is one of the most crucial elements in achieving the highest level of accuracy from any firearm. Installation of a quality trigger will permit a light pull with little or no creep and overtravel. The trigger should break cleanly and consistently at a predetermined level usually measured in pounds. Triggers should be selected for the application in which the firearm will be used. A two pound match trigger has no place in a service rifle and a National Match Rifle will not perform well with a twelve pound mushy unpredictable trigger pull. Fortunately for AR15 owners are there is no shortage of companies manufacturing improved triggers. A quick search on the Brownells web site returned a search result of two pages of AR15 triggers. 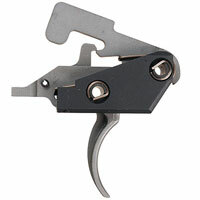 AR15 triggers are available in several different installation configurations. Typically there's two approaches for replacement. 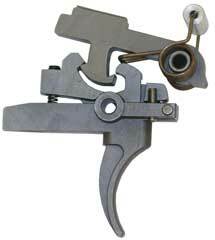 The first approach is a drop-in trigger which replaces the stock trigger group with a new hammer, trigger, sear and spring. The parts are installed identically to the stock trigger. An example of this would be the Geissele Automatics. The second approach is a module that arrives fully assembled. The module contains the new trigger group parts encased in a housing pre fitted and adjusted. 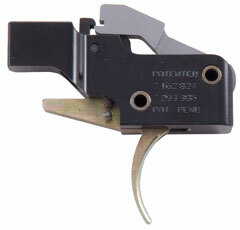 This module is secured by the same pins that secure the stock trigger. 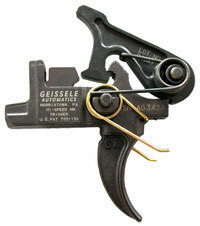 An example of this trigger would be the American Trigger Corporations Gold Modular Trigger. Within the two categories mentioned previously the triggers can be broken down into sub groups. These would be single stage, two stage. Two stage trigger has a long initial movement. The shooter pulls the trigger back to take up this slack until a sharply increased resistance is felt. (That is the first stage.) 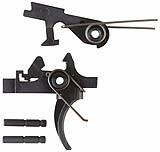 Then the actual surprise break trigger pull that will fire the rifle is begun, and from that point on the two stage trigger operates like a single stage trigger which then can be broken down again into adjustable and fixed. The triggers can be broken down again to a subset of adjustable and fixed. Fixed is exactly as the name implies. What you install is what you get. Adjustable triggers can be had in several configurations. Some of these triggers might just be adjustable for pull weight while other may have adjustments for pull weight, take-up, overtravel and engagement. Therefore to select the appropriate type trigger decide which installation method, drop-in or modular, type of pull,single or two stage and fixed or adjustable. Note: If you have a Colt AR15 you need to determine the size of the pins in your lower receiver before selecting a new trigger. Read about the pin sizes here. Self-contained trigger/assembly installs in minutes and delivers a light, smooth, match-grade trigger pull free of grittiness, with an ultra-crisp letoff and short reset. Simply remove factory trigger and safety selector, drop in the module, reinstall selector and pins, and you're ready to shoot. Completely new engagement geometry design produces the light 3-lb. pull and crisp release without compromising reliability or safety. The two-stage design is adjustable for sear engagement and overtravel, with a first-stage take up of approximately 6 ounces, followed by actual sear movement taking up the rest of the weight, the reverse of the military two-stage AR trigger pull profile. Instead, the shooter can build force steadily, maintaining precise control and keeping his attention on the target. After release, reset travel is only .030", less than half the .070" typical of standard match triggers, to aid in fast, accurate follow-up shots. The sear captures the hammer at the back instead of near the pivot point to help produce the light pull and maintain safety. A second, independent, intercepting sear is positioned to block the hammer if it slips off the primary sear, as when the weapon is dropped or suffers hard impact. If the intercepting sear captures the hammer, pulling the trigger will still fire the rifle, though with a heavier pull weight. In addition, the AR Gold system uses the rifle's factory safety to positively capture the hammer, like an M1 Garand, and roll it back below the primary sear for an extra margin of safety. A lightweight aluminum housing contains the entire system and maintains the correct tolerances between the working parts. The receiver pins serve only to anchor the module in the receiver, with no effect on trigger function. Hammer and sear are wire-EDM cut from ultra-hard S7 tool steel to exceptionally tight tolerances with precision-ground surfaces for consistent contact and smoothness. 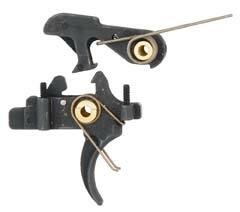 This remains my favorite drop-in modular trigger at any price if not my favorite trigger. The LWRCI AR-15 ENHANCED FIRE CONTROL GROUP. Upgrade that gritty ol' single stage to the LWRCI Enhanced fire control group! Plated in our proprietary nickel coating this hammer, trigger, disconnector combination provides you with one of the finest mil-spec triggers available. No grit, no slop just smooth shooting. Kit includes enhanced hammer, trigger and disconnector with all neccessary springs and pins. L02-0061A03. Visit LWRCI. Fully adjustable trigger gives a smooth, two-stage pull with a precise icicle sharp break and ultra-fast lock time to minimize accuracy loss caused by gun movement during trigger pull. 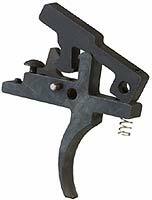 Set first stage pull weight by bending the legs of the trigger spring; set second-stage weight within a pre-set range by turning its adjustment screw. Another screw on the trigger lets you adjust overtravel for clean, crisp letoff. Lightweight hammer provides a 50% reduction in lock time over factory hammer, yet uses standard weight hammer spring to ensure sufficient energy transfer for reliable primer ignition, even on AR-style .308 weapons. Trigger shoe is positioned 1/8" farther forward than factory shoe for comfortable finger position during the squeeze. All contact surfaces are wire EDM cut to exact dimensions for full, precise engagement free of unwanted play. Available to fit both large (.169") and small (.154") pin receivers; small pin models include spare hammer pin to aid in proper fit on receivers with slightly oversized holes. Service model provides nominal 4 1/2 lb. pull weight required for NRA High Power Service Rifle competition and is also approved for CMP-sanctioned competitions. Most of the pull weight is loaded on the first stage, followed by a quick, clean second-stage break. First stage, 3.2 to 5 lb. ; second stage, 1/2 to 1 1/2 lb. Match model allows a very low combined pull weight for superb trigger control on highly modified raceguns used in unlimited NRA High Power Rifle competition. Helps you shave those extra hundredths of an inch from your groups for a competitive edge. First stage, 1.3 to 3 lbs. ; second stage, 4 oz. to 14 oz. Designated Marksman Rifle (DMR) model combines the light first stage of the Match trigger with the heavier Service second stage to reduce risk of premature release in high stress situations. Perfect for precision tactical and competitive shooting where trigger pull is not regulated. Allows a high rate of semi-auto fire; an experienced shooter can fire 30 rounds in as little as 4 1/2 seconds. First stage, 1.3 to 3 lbs. ; second stage, 1/2 to 1 1/2 lbs. SPECS: Steel, black finish. Available for receivers with .154" (military, current aftermarket, older Colt) and .169" (current Colt without sear block) hammer and trigger pins. Kit includes trigger and hammer assemblies, plus oversized hammer pin, compact pin punch, three hex wrenches, tube of GA No. 1 grease, bottle of GA No. 2 oil, and complete illustrated instructions. for customers in the U.S. Special Operations community. 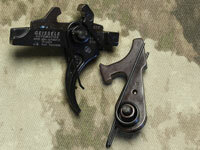 The SSA is a non-adjustable combat trigger, it is not a match trigger. the Geissele SSA features and advantages follows. engagement are non adjustable by the shooter. Trigger and hammer are made from quality tool steel. Sear surfaces are cut by a wire edm machine. Sears cut this way are very accurate and the non-directional surface finish of the wire edm gives a smooth trigger pull without the associated grittiness of directional machining marks left by a milling cutter. The initial force needed to start the disengagement of the sear surfaces is low and the force linearly increases at a low rate. This helps the shot to fall at the initial point of aim and aids in building shooter confidence in his weapons ability to put the rounds where his sight is pointing. The Geissele SSA trigger allows the shooter to slap through the trigger pull on close in shots but also set up a long range shot with a crisp trigger break. A full force hammer spring is used for quick locktime and positive ignition of all types of ammo. No lightened hammer spring is used. The hammer is lighter than a standard AR15 hammer. The lightened hammer favorably decreases locktime and increases accuracy of the weapon, especially for snap shots. identical to the standard AR15 single stage sear. However, this secondary sear has surfaces that never touch during normal operation. This sear prevents the hammer from falling unless the trigger is pulled. The secondary safety sear contributes to shooter confidence in dynamic/vehicle situations where a fellow shooter’s muzzle may cover him. There is firm knowledge that even with the safety in the fire position the weapon can never discharge unless the trigger is pulled. 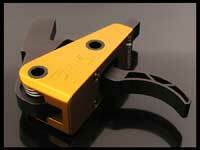 Trigger timing is robust and parts have been sized to operate with a certain amount of wear to the working surfaces. The trigger is designed to operate in dusty, abrasive environments that cause wear. The JARD AR-15 Trigger System come in two models, an adjustable model and a non-adjustable model. The adjustable model will let you fine turn your trigger the way you like it. The non-adjustable gives you a quick and easy upgrade to your AR. Easy to install, non-adjustable, AR-15 trigger replaces the heavy, gritty-feeling, factory hammer and trigger for a smooth, clean-breaking pull that's sure to improve accuracy. Unique, single-stage design positions the sear engagement point behind the hammer for added leverage and a dependable, 3-pound pull weight. High-performance, low mass hammer reduces lock time. Precision-cut engagement surfaces are heat-treated for low wear. Requires gunsmith fitting in receivers with a sear block. Single-stage trigger kit reduces pull weight to improve accuracy, without gunsmith fitting. 2, 3, and 4.5 lb. models provide the perfect pull weight for hunting or competition. Adjustments for sear engagement, trigger over-travel, disconnector engagement and safety lets you achieve a smooth, consistent trigger pull. Sear engagement point located behind the hammer improves leverage to reduce pull weight; low mass hammer gives faster lock time. Engagement surfaces are hardened and polished for a smooth, clean-breaking pull. Patented trigger mechanism provides outstanding reliability, function, and performance for benchrest, varminting, and other types of precision shooting. All internal components are CNC machined from stainless steel, then heat-treated to Rc 58 for extended service life. Adjustment screws are fitted with a nylon insert to maintain your trigger settings without using thread locking compounds. Features a two-stage pull that is uniquely adjustable from above the lower receiver for first stage pull weight, second stage sear engagement, second stage pull weight, and overtravel. Models available to fit rifles with small and large hammer/trigger pins. Redesigned geometry adds a clean-breaking, smooth-feeling trigger with a light pull to any AR-15. Speedlock hammer and disconnect are EDM-cut from solid stainless, then heat treated for durability. 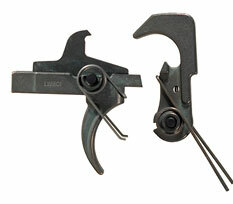 Trigger and hammer feature improved sear angle and notch with neutral engagement for lighter letoff and minimum creep. Adjustable for weight of pull from 3 1/2 to 4 1/2 lbs. Drop-in, match grade trigger provides a crisp, 4 1/2to 5 lb., 2-stage, trigger pull to improve accuracy for competition or varmint shooting. Sear engagement point is located behind the hammer to reduce pull weight. Low mass hammer speeds lock time. Includes trigger and hammer pins. Fits AR-15 receivers with .154" hammer and trigger pins. Why settle for a sloppy trigger which can cause a good rifle to shoot badly? Now shooters can replace creepy two-stage triggers with one that is smooth and breaks crisp. The trigger is factory preset with a pull weight of either 3 or 4 pounds. Installation is quick and no adjustments are necessary, 100% true drop-in trigger. The trigger module installs using your rifle's original hammer/trigger pins and the proprietary design eliminates pin rotation and walkout. Since it was founded in 1946, Timney Manufacturing has built a reputation based on the quality of its products. Because of the precision machining and workmanship that goes into each and every Timney product they are often referred to as "The World"s Finest Triggers" and they are used exclusively by some of the world"s best custom gun manufacturers. Drop-in trigger module fits any mil-spec small-pin AR-15 and delivers a light, superbly crisp trigger pull right from the box, with no adjustment or fine-tuning. Single-stage, 4-lb. pull has zero take-up and an ultra-clean break that's closer to a bolt action than a typical tactical rifle. Exceptionally short, positive reset gets you back on target and ready to take the next shot almost instantly. Unique hammer geometry keeps weight to a minimum for ultra-fast lock time, yet provides plenty of kick to ensure reliable ignition, even on hard military primers. A secondary rescue sear grabs the hammer if the primary sear fails when the weapon is dropped or severely jarred, meets military specifications for drop safety. CNC-machined, hardened tool steel hammer, sear, and trigger body with precision-ground contact surfaces are built to run hard in competition or combat, all contained in the rugged machined aluminum housing. Includes two .154" pins and installation instructions.